The Sports Bike segment in India has gained prominence over the years with good offerings and new technologies. Suzuki and Yamaha both are well known Japanese makers who come out with extra ordinary products in the two wheeler segment. 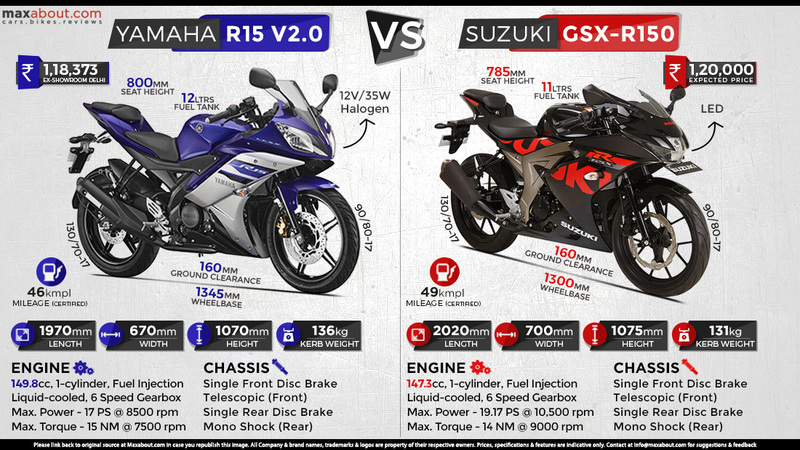 In the above infographic you can have a good look on a comparison between Suzuki GSX-R150 and Yamaha YZF-R15 V2. Both of them are Sports Bikes in the 150cc segment. Both companies have paid close attention to the aesthetic design and performance of their respective bikes. The Suzuki GSX-R150 comes with a 147.3cc engine which gives out a max power of 19.17 PS @ 10,500 rpm and a maximum torque of 14 Nm @ 9000 rpm. The sports machine comes with a single cylinder engine with 6 speed manual transmission. The Sports bike is expected to be launched at a price of INR 1,20,000. Suzuki claims GSX-R150 to give a mileage of 49 kmpl. The bike comes with front and rear disc brake. The bike also has telescopic fork suspension for the front and mono-shock for rear. The kerb weight of GSX-R150 is 131 kgs, making it lighter by 5 kgs in comparison to the Yamaha R15 V2. Yamaha YZF-R15 V2 comes with a 149.8cc single cylinder engine which gives 17 PS of power @ 8500 rpm and 15 Nm of power @ 7500 rpm. The bike also like Suzuki GSX-R R150 comes with a standard 6 speed manual transmission. The Yamaha sports bike gives a mileage of 46 kmpl, almost same as it's Suzuki competitor above. It runs on a 12 litres fuel capacity and has a ground clearance of 160 mm. This bike also comes with front and rear disc brake, and telescopic fork front and mono shock rear suspension. The Yamaha YZF-R15 V2 is priced at INR 1,18,373 ( ex-showroom Delhi ). Click here to know more about Suzuki GSX-R150. Downloaded 135 times this week.